You would like to perform a FUE hair transplant without any shaving? FUE hair transplant without shaving of the recipient area, or even an FUE hair transplant without any type of shaving, either in the recipient area plus in the donor area? 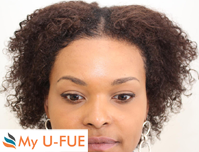 Then you are exactly right on our website, the "My U-FUE" hair transplant Technique of the World Hair Transplant Center - My WHTC from Dr. Patrick Mwamba! Our medical Director Dr. Patrick Mwamba, Brussels/Belgium - is one of the most experienced fue hair surgeon worldwide (FUE since 2002). Modern FUE hair transplant today achieves beautiful results but most hair shaving is required. More and more patients in representative occupations and special celebrities (VIPs) wish a hair transplant without shaving head and asking for a hair transplant without any type of shaving (no and zero shave of recipient area or/and donor area see also No Shave FUE Hair Transplant - "My U-FUE Classic") and to be fast socially acceptable again. Dr. Patrick Mwamba, the clinical director of WHTC is performing high quality FIT/FUE (Follicular Unit Extraction) since 2002 and offering the unshaved "My U-FUE Classic - Hair Transplant" - FUE without any shave (either donor area nor recipient area) since 2010. 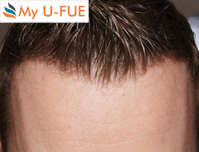 Read more about the > FUE without shaving head technique - "My U-FUE Classic"). Many patients - especially celebrities, VIPs, women and men who want to be quickly socially acceptable again - choose often still today for an FUT - strip, because with the Follicular Unit Extraction (FUE) many hair surgeons often shaving (shave) the complete hair on the entire head, or shaven at least the complete hair in the donor area. But this means to be not quick socially acceptable. This - as well as the significantly higher costs and significantly longer operation time - are the biggest disadvantages of Follicular Unit Extraction. Therefore, nowadays still many women and men decide against FUE. Basically, in all variants of My U-FUE hair transplant from the World Hair Transplant Center - WHTC, there is zero shave, no shaving, no shave of hair and no short hair cut of the recipient area needed. If there are still hair in the reception area, they can left longer - and the not shaved/not shortened - hair possible can help to hide the scabs and redness after an hair restoration and to be faster socially acceptable! For example, after an hair transplantation in the temples/receding hairline the long hair and not shaved and not shortened hair may help to make the crusts/scabs and redness almost unrecognizable when the remaining hair is combed over the transplanted area. As for example, the long hair may help, when the unshaved - non shaven fue hair transplant done in existing areas. Then scabs and redness between the longer hairs are hard to see. As one of the few doctors worldwide, Dr. Mwamba offers the "Non Shave" Follicular Unit Extraction without any type of shaving, the → "My U-FUE-Classic". 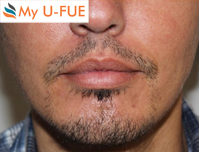 The picture above: Unshaven Donor Area - "My U-FUE Classic"
For more infos please read → the unshaven and no shaving FUE "My U-FUE Classic". WHTC: Cheaper My U-FUE hair transplant possibilities: "My U-FUE GJ Cut" and "My U-FUE Patchy Shaven"
For patients (whether women or men) who accept a shave from the hair in the donor area (but still there will be zero and no shave in the recipient area), Dr. Mwamba and My WHTC offers cheaper options of high quality My U-FUE hair transplant. Please read also the chapter My U-FUE GJ Cut and My U-FUE Patchy Shaven. For more general information about the price and costs of all the possibilities of My U-FUE please read → Price and Costs. For the hair restoration (like in the receding hairline (temples), in thinning hair areas, a high forehead, or bald head) it is important to know that a hair transplant can only be performed to patients undergoing androgenic hair loss (applies to women and men). Other patterns of hair loss, such as diffuse or circular hair loss (alopecia areata) may not be treated within the spectrum of surgical hair transplant. This is why every patient is advised to undergo a thorough medical investigation prior to a procedure to exclude a possible disease or pathological hair loss. Eventually sufficient donor hairs are necessary to achieve a successful and satisfying result during the hair restoration process. The non shaven fue offered by Dr. Mwamba has the advantage that the long hair can keep long and the not shaved and not shortened hair may help to make the crusts/scabs and redness almost unrecognizable when the remaining hair is combed over the transplanted area. For contact and more info for men and women about the Non shaven FUE VIP Solution and regarding the premium and luxury unshaven - unshaved and zero shave hair restoration by Dr. Mwamba (fue without shave head technique see also our fue without shaving) you can contact us all the time. Please see WHTC Contact or write us an mail to info_at_ufue.info or use our contactform or consultationform all the time! We are happy to inform you about WHTC/Dr. 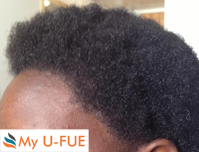 Mwamba and the possibilities of a FUE VIP Solution respectively unshaved My U-FUE hair transplantation in women and men and without shave / no short cut / shorten / zero shave from the recipient and removal/donor area.